The term tool steel is a generic description for those steels which have been developed specifically for tooling applications. These steels are used for making tools, punches and dies etc. Tools used for working steels and other metals must be stronger and harder than the steels or the materials they cut or form. Normally tool steels are known for their distinctive toughness, resistance to abrasion, their ability to hold a cutting edge, and/or their resistance to deformation at elevated temperatures (red hardness). Some of the operations that tool steels are used for include drawing, blanking, mould inserts, stamping, metal slitting, forming and embossing, although their use is not limited to just these areas. The metallurgical characteristics of various compositions of tool steels are extremely complex. There are hundreds of different types of tool steels available and each may have a specific composition and end use. Tool steels are mainly medium to high carbon steels with specific alloying elements added in different amounts to provide it special characteristics. The carbon in the tool steel is provided to help harden the steel to greater hardness for cutting and wear resistance while alloying elements are added to the tool steel for providing it greater toughness or strength. In some cases, alloying elements are added to retain the size and shape of the tool during its heat treat hardening operation or to make the hardening operation safer and to provide red hardness to it so that the tool retains its hardness and strength when it becomes extremely hot. Various alloying elements in addition to carbon are chromium (Cr), cobalt (Co), manganese (Mn), molybdenum (Mo), nickel (Ni), tungsten (W), and vanadium (V). The effect of the alloying elements on the properties of tool steels is as follows. Chromium – It results into deeper hardness penetration during heat treatment and contributes wear resistance and toughness to the tool steel. Cobalt – Cobalt is usually used in high speed steels and it increases the red hardness so that these steels can be used at higher operating temperatures. Manganese – when used in small quantities, manganese aids in making tool steel sound and further additions help tool steel to harden deeper and more quickly in heat treatment. It also helps to lower the quenching temperature necessary to harden steels. Larger quantities of manganese in the range of 1.20 % to 1.60 % allow tool steels to be oil quenched rather than water quenched. Molybdenum – In tool steels molybdenum increases the hardness penetration during heat treatment and reduces quenching temperatures. It also helps increase red hardness and wear resistance. Nickel – Nickel adds toughness and wear-resistance to the tool steels. It is used in conjunction with hardening elements. Vanadium – Vanadium in small quantities increases the toughness and reduces grain size in tool steels. Vanadium in quantities greater than 1 % provides extreme wear resistance especially to high speed steels. Smaller amounts of vanadium in conjunction with chromium and tungsten help in increasing red hardness properties in tool steels. The designations of tool steels as per American Iron and Steel Institute (AISI) are as follows. The tool steels are designed to have compositions which are compatible for their special purpose use. Certain tool steels are made for producing die blocks while some are made for making moulds. Some tool steels are made for the purpose of hot working while some others are made for high speed cutting applications. 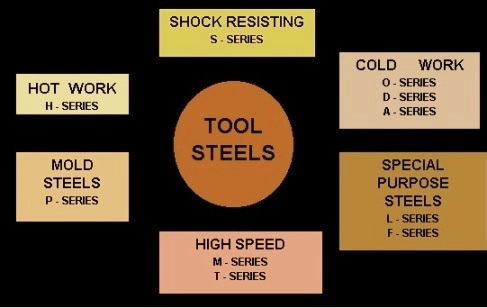 Tool steels are classified into the following types. High speed tool steels – High speed tool steels are used for cutting tools where strength and hardness must be retained at temperatures upto 760 deg C. These steels include all molybdenum and tungsten based steels. High speed tools steels can be hardened to 62-67 HRC and can maintain this hardness in high service temperatures. This makes these steels very useful in high speed machines. Typical applications are end mills, drills, lathe tools, planar tools, punches, reamers, routers, taps, saws, broaches, chasers, and hobs. Cold work steels – These tool steels have high strength, hardenability, impact toughness, and wear resistance. These steels can be oil hardening type, air hardening medium alloy type, or high carbon high chromium type. These steels are used in those working conditions where operating temperatures are typically less than 200 deg C. These tool steels are used on larger parts or parts that require minimal distortion during hardening. The use of oil quenching and air hardening helps reduce distortion as opposed to higher stress caused by quicker water quenching. More alloying elements are used in these steels, as compared to water-hardening grades. These alloys increase the steels’ hardenability, and thus require a less severe quenching process. These steels are also less likely to crack. Typical applications include cold working operations such as stamping dies, draw dies, burnishing tools, coining tools, and shear blades. Hot work steels – These steels have many of the properties of cold working steels, with the added advantage that these properties are retained at elevated operating temperatures where the tool literally becomes red-hot. Hot work tool steels include all chromium, tungsten, and molybdenum alloy steels. They are typically used for forging, die casting, heading, piercing, trim, extrusion, and hot shear and punching blades. Shock resistant tool steels – These tool steels are designed to resist shock at both low and high temperatures. Low carbon content is required in these steels for the necessary toughness (around 0.5 % carbon). Carbide forming alloying elements provides the necessary abrasion resistance, hardenability, and hot-working characteristics in these steels. This family of steels displays very high impact toughness and relatively low abrasion resistance. These steels can attain relatively high hardness (HRC 58/60). These steels are among the toughest of the tool steels, and are typically used for jackhammer bits, screw driver and shear blades, chisels, knockout pins, punches, and riveting tools. Water hardening tool steels – These tool steels do not retain hardness at elevated temperatures but they have high resistance to surface wear. They begin to soften above 150 deg C to a noticeable degree. These steels are essentially high carbon plain carbon steels and can attain high hardness (HRC 66). These steels are brittle compared to other tool steels. This type of tool steels are the most commonly used tool steels because of their low cost compared to other tool steels. They work well for small parts and for those applications where high temperatures are not encountered. Typical applications include blanking dies, set screws, files, drills, taps, countersinks, hammers, sledges, reamers, shear blades, razor blades, lathe tools, jewellery dies, and cold striking dies etc. Mould steels – Mould steels include all low carbon and one type medium carbon tool steels. They are typically used for compression and injection moulds for plastics, and die casting dies. Special purpose tool steels – These steels include low alloy tool steels. They are usually quenched, which makes them relatively tough and easily machinable. They are typically used for arbors, punches, taps, wrenches, drills, and brake forming dies. Besides chemical composition, the following three properties affects most the performance of tool steels. Hardness – It is a measure of steel’s resistance to deformation. Hardness in tool steels is most commonly measured using the Rockwell C test. Hardened cold work tool steels are generally about 58/64 HRC depending on the grade. Most are typically about 60/62 HRC, although some are occasionally used up to about 66 HRC. Tools which plastically deform in service possess insufficient hardness. Permanent bending of cutting edges, mushrooming of punch faces, or indenting of die surfaces (peening) all indicate insufficient hardness. Toughness – Toughness, as considered for tooling materials, is the relative resistance of a material to breakage, chipping, or cracking under impact or stress. Toughness may be thought of as the opposite of brittleness. Most tool steels are notch sensitive, meaning that any small notch present in the sample will permit it to fracture at a much lower energy. In addition to inherent material properties, the impact resistance of tool components is significantly impaired by notches, undercuts, geometry changes, and other common features of tools and dies. In service, wear failures are usually preferable to toughness failures (breakage). Breakage failures can be unpredictable, catastrophic, interruptive to production, and perhaps even a safety concern. Toughness data is useful to predict which steels may be more or less prone to chipping or breakage than other steels, but toughness data cannot predict the performance life of tools. Wear resistance – It is the ability of material to resist being abraded or eroded by contact with work material, other tools, or outside influences (scale, grit, etc.) Wear resistance is provided by both the hardness level and the chemistry of the tool. Wear tests are quite specific to the circumstances creating the wear and the application of the tool. Most wear tests involve creating a moving contact between the surface of a sample and some destructive medium. There are 2 basic types of wear damage in tools, abrasive and adhesive. Wear involving erosion or rounding of edges, as from scale or oxide, is called abrasive wear. Abrasive wear does not require high pressures. Abrasive wear testing may involve sand, sandpaper, or various slurries or powders. Wear from intimate contact between two relatively smooth surfaces, such as steel on steel, carbide on steel, etc., is called adhesive wear. Adhesive wear may involve actual tearing of the material at points of high pressure contact due to friction. It is often expected that a harder tool will resist wear better than a softer tool. However, different grades, used at the same hardness, provide varying wear resistance. In fact, in some situations, lower hardness and high alloy steel grades may outwear higher hardness and lower alloy steel grades. Thus, factors other than hardness must contribute to wear properties of the tool steels.